KNRUHS MSc(NURSING) & MPT ADMISSIONS FOR ACADEMIC YEAR 2017-18. Notification for final phase of on-line Counseling for Admission into vacant seats after first phase of counseling in MSc (Nursing) and MPT Courses into colleges affiliated to KNR University of Health Sciences for the academic year 2017-18. 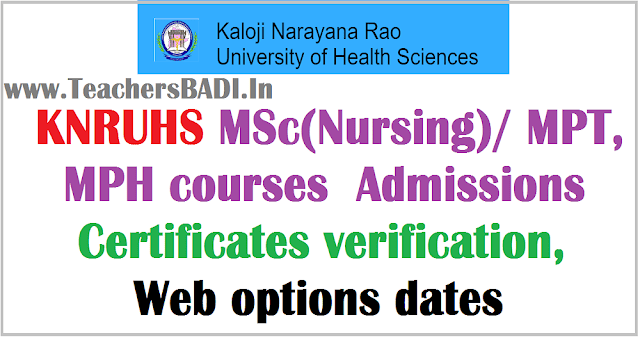 KNR University of Health Sciences, Warangal, Telangana State hereby notify that the final phase of on-line counseling will be conducted for Admission into MSc ( Nursing ) and MPT Courses for vacant seats after first phase of counseling in Colleges under KNR University of Health Sciences, Warangal, Telangana State as per schedule given below on 01-12-2017. The candidates whose names have been notified in the merit list of candidates displayed on KNR UHS web-site after verification of Original Certificates are directed to attend Final Phase of on-line counseling for admission into MSc (Nursing) and MPT Courses for the academic year 2017-18 into the Colleges in Telangana State affiliated to KNR UHS at Prof. Ram Reddy Center for Distance Education, OU Campus, ( PGRRCDE) Hyderabad. M.P.T. 01-12-2017 1.30 P.M. 1 to Last Rank. NOTE : List of vacant seats will be displayed on KNRUHS web-site on 30-11-2017. 2) Candidates have to be present in person. Proxies will not be permitted under any circumstances. done if candidates are not available for seats reserved for male candidates and seats reserved for categories. 4) Mere attending for counseling does not confer any right for admission as more number of candidates have applied for limited number of available seats. 5) Admissions will be done into MSc (Nursing) Course as per regulations of INC and Government of Telangana Rules. 6) Admissions into MPT Course will be done as per Government of Telangana Rules. KNRUHS MPT course Admissions Certificates verification, Web option dates 2017: KNRUH MPT ADMISSIONS FOR ACADEMIC YEAR 2017-18 - Notification for first and final verification of Original Certificates and Counseling for Admissions MPT Courses into colleges affiliated to KNR University of Health Sciences for the academic year 2017-18. KNR University of Health Sciences, Warangal, Telangana State hereby notify that the first and final verification of certificates and counseling will be conducted for Admissions into MPT Courses in Colleges under KNR University of Health Sciences, Warangal, Telangana State as per schedule given below on 05-11-2017 & 8-11-2017.